Ron, pictured left, was attacked by a bicyclist while he was praying outside of Planned Parenthood. SAN FRANCISCO—A graphic video has surfaced online showing an 85-year-old man being attacked while praying outside of Planned Parenthood facility in San Francisco March 21. 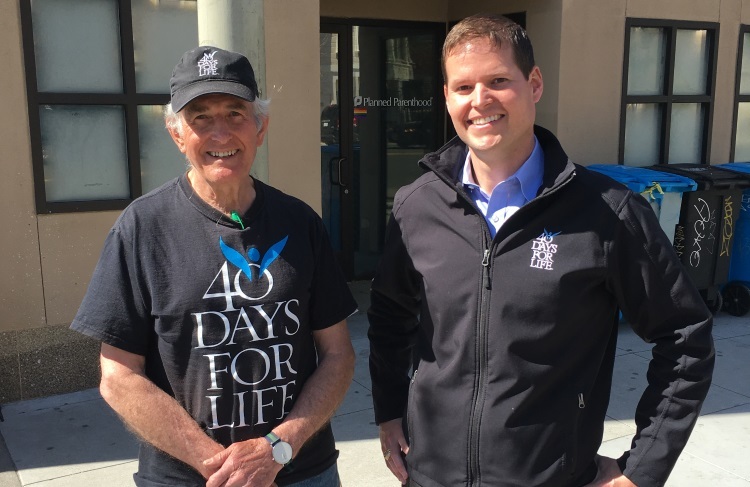 Ron, a long-time 40 Days for Life leader, was repeatedly kicked by a supporter of Planned Parenthood. The attacker cut the group’s signature banner with a pair of scissors and knocked Ron and another volunteer to the ground. As seen in the YouTube video that went viral, Ron attempted to stop the same attacker from stealing the sign by holding on to it and sticking the sign pole through the spokes of the man’s bike. The attacker responded by pushing Ron to the ground with his bike, and said “Old man, stay on the ground old man, unless you want to get hurt.” The suspect started kicking Ron and the video ended. The San Francisco Police Department is searching for the individual who attacked Ron, who sustained bruises from the attack. Ron is continuing to praying outside of Planned Parenthood.